With everything starting to wind down, our group woke up around 7:00 am just in time to see those who has spent the night at the Holy Sepulcher. We all had to pack up our bags and load them onto the bus. Everyone ate one last breakfast and we made our way onto the bus for a quick trip to Dominus Flevit and the Stations of the Cross. Possibly one of the most surreal of experiences would be the Stations of the Cross in Jerusalem. Most are in churches, but there are a few that happen to fall just in the street with vendors all around. One of them requires you go through a gift shop first. Even though it was a little difficult to keep a pious demeanor, we all gained significantly from the experience ending at the Holy Sepulcher. After spending a little time praying, we moved on to our lunch back at the Notre Dame center. The Sepulcher was a busy place, and we were able to see a neat procession with the Patriarch of Jerusalem. On our way to the ND Center we stopped in at the Church of the Holy Savior, the only Latin Rite parish in Jerusalem. We finally made it to lunch and took some time to relax. At the ND center they have a wonderful exhibit on the Shroud of Turin. We were guided through the exhibit by one of the consecrated living in Jerusalem. I thought the neatest fact was that while Christ is currently depicted with a crown of thorns that is a circle, in reality it would have most likely been an entire hat covering his head. I got tons of pictures of it, so the students will shortly be able to show you. From there we went to Mt. Zion where we visited many different sights. The first was the upper room where the apostles had the last supper. Interestingly this is owned by Muslims so only three complete Masses have been said there: one by Pope Pius VI, one by JP2, and one by Francis. We read two reflections, both the last supper and Pentecost, and then onto the High Priest Caiaphas’ house where Christ would have been imprisoned while waiting to be given to the Romans. We headed back to the Notre Dame Center for Holy Thursday Mass where the Papal Nuncio was celebrating the Mass. Two students (Lucas and Jimmy) and I were part of the washing of the feet. It was a great experience, if a little humbling. Here is a man who works directly for Pope Francis washing my foot. Definitely a unique experience. We continued in a procession after Mass to a repository where the Eucharist will stay until Easter Sunday. We finished everything up by eating dinner and getting on the bus to head back to the airport. Since Father was staying in Jerusalem for the family pilgrimage, I was told that I’d be leader for the group to get through security in the airport. Everything worked out well, but it was the most stressful hour of my entire trip since a couple kids got pulled aside to help them test a couple new security guards. Of course my luck prevented me from getting through the baggage check or final security checkpoint quickly and we made it to the gate about 15 minutes before boarding. But then we were on the plane and heading on the way home to the good ol’ USA. The flight was mostly uneventful. Most kids slept, several for the entire trip. We made it into the airport a little later than expected, but getting through security was mostly uneventful. Apparently you can bring pinecones into the USA from Jerusalem provided that there are no bugs on it. Thank Joe for testing this particular rule. This is where our group started to split up as several students had other planes to catch. We are currently waiting to board of final flight home. This trip has been a significant test of the mettle of both the spiritual and physical strength of the students. I have seen them at their most awake and energetic as well as their most tired and groggy. I have seen students who I would never think of as overtly spiritual cry, students who have major faith troubles work through them, students who will never listen in class listen intently to our wonderful tour guide Ahni for hours on end, but most of all I have seen these kids grow closer to Christ both literally and figuratively. I leave you all with this one thought to ponder; something that I heard years ago that seems apt today. It is not that Christianity has been tried and found wanting, it has been found difficult and not tried. These kids have all walked the difficult roads of Jerusalem. They have tried the Christian faith in all its difficulties and never found it wanting. They can now say that they walked in the footsteps of Christ and gained from it. And I was lucky enough to watch them do this. Thank you, Matt, for persevering to provide us with these blogs. 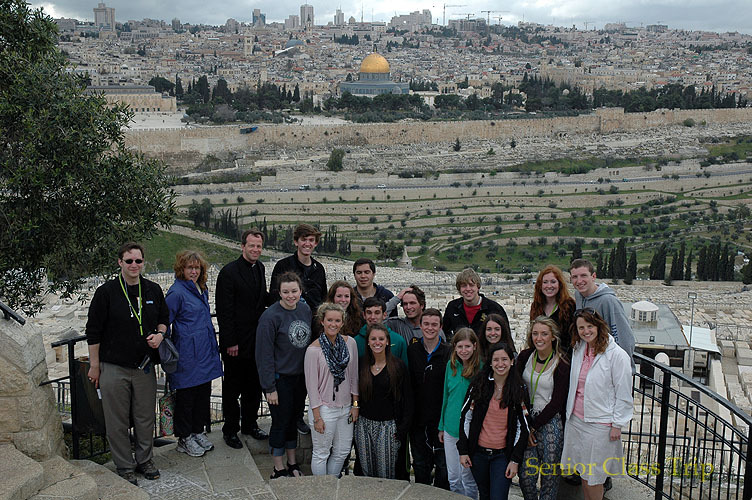 We are all better for it, and have a perspective of our EC students/children, you, and the Holy Land that is priceless. Only to be outdone by making this pilgrimage ourselves!